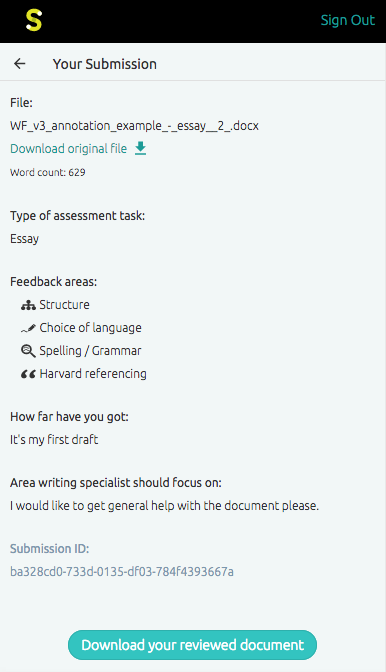 Just click on 'Upload your document' any time of day or night, to submit an essay or assignment for feedback from one of our Writing Specialists. 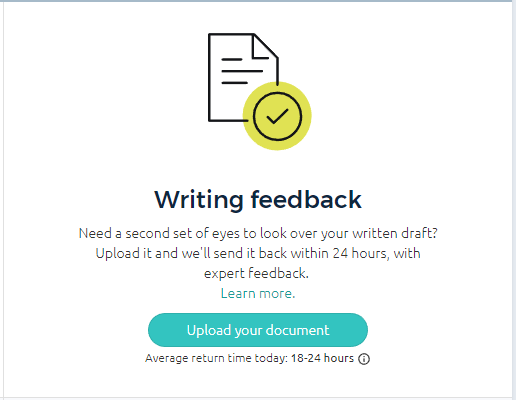 Once you've clicked on the button above, you'll need to tell us a little about the file you'd like us to review, and upload it. We support doc, docx, odt, txt or rtf files with a maximum word count of 5500 words and file size under 4 MB. 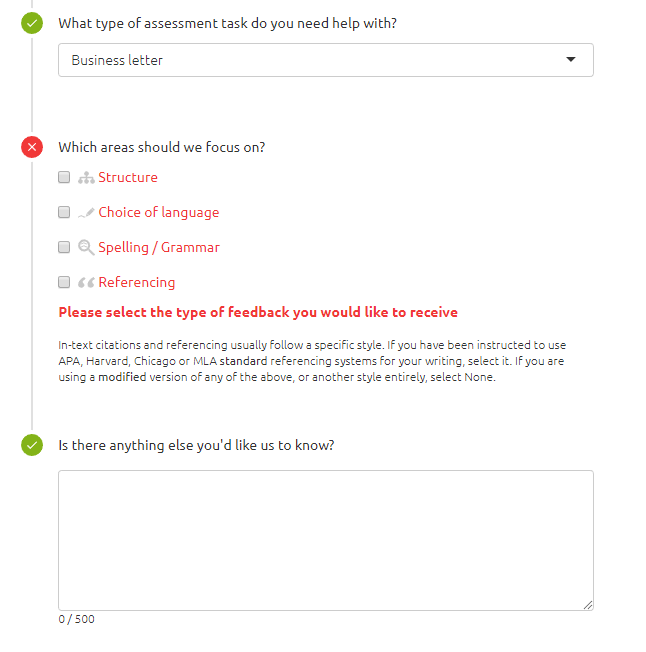 You'll have just four simple and quick questions to fill out before hitting the 'send for review' button. Phew! Once you've successfully sent for review, you can sit back, relax, make some noodles, pat your cat, water your succulents etc. while your document goes off, off and away, into the very best of hands. Keep an eye on your email inbox, because we'll send you a message within 24 hours, letting you know when your feedback has been completed. Remember to mark emails from Studiosity as safe, otherwise your notification may end up in your spam folder! Alternatively you can also log in to your account and click on the 'Your documents' link in the top menu of your homepage and pick up your document there. You can also cancel or update your submission with a newer version from the 'Your documents' menu, as long as its status is 'Submitted', and it has not yet been picked up for review by a specialist. If you update your submission, it won't lose its place in the queue! Please note: when you update your submission and the word count changes, your account will be debited or credit minutes accordingly, if you have a minute limit in place. 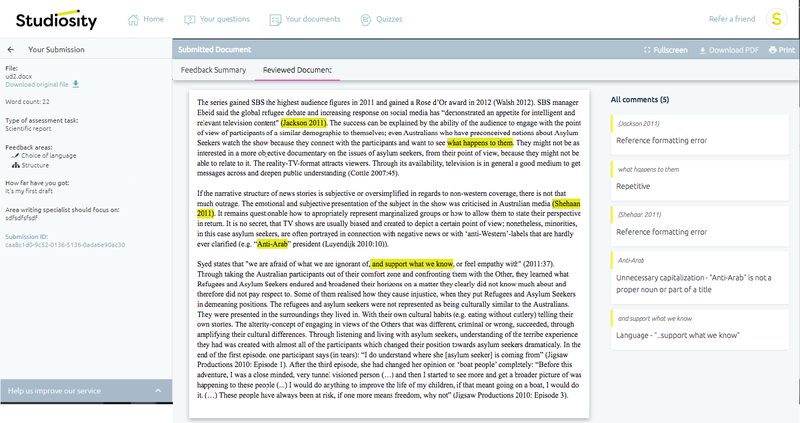 On the left-hand-side you'll see all of your submission details, including the file name and your question. 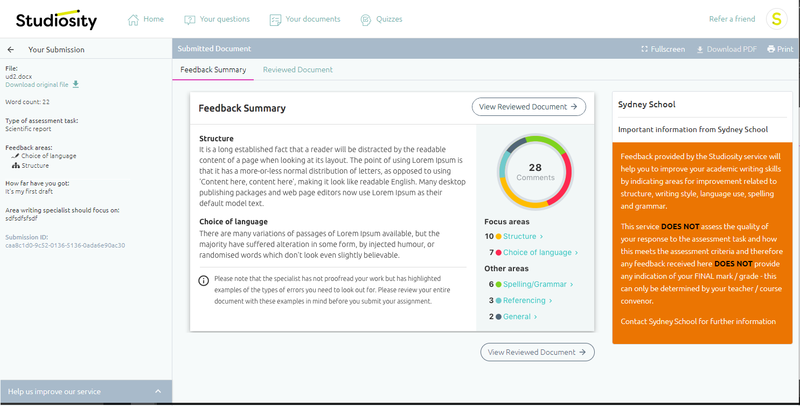 At the centre of the page, you will see the Feedback Summary, which is the overall summary of the strengths and weaknesses in your document. 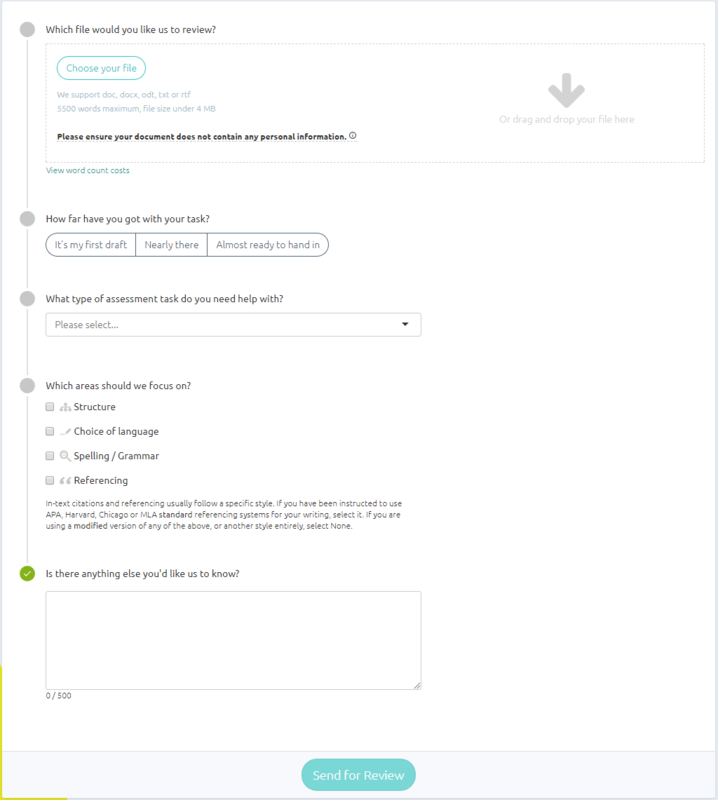 You'll see a colourful donut chart showing the specialist's comments, categorised into the areas you requested feedback on, and anything else they have noticed. When you're ready to view the whole thing, you can click on 'View Reviewed Document' at the bottom of the screen, or toggle the tabs at the top. You can then click on highlighted sections of text to see specific comments in the comments bar, or hit 'Show All' to see them all in one place. And of course, if you want a good old-fashioned hard copy of your document, you can click on Download or Print in the top right-hand-corner. Want to collect your document on your phone? No worries, you can do that too. To make the most of the small mobile screen, you'll see a link at the bottom of your screen that allows you download a mobile-friendly PDF.